Look on My Flow, Ye Mighty and Despair! NB: This is a re-post from a while back, but someone asked me tonight about my teaching style, and this post pretty much sums it up. This one's for you, Daniel Lippman! Continuing on the "heady week" theme, Friday was simply one one those awesome days. I had a plan going in to English classes on Friday, but our Veteran's Day assembly lopped about twenty minutes off the front end of my seventh grade class. As the class after the assembly was an "open classroom" period, parents showed up in the back of my classroom to watch. No pressure there. Five moms, all less than easily impressed on a good day, waited to see what sort of show I'd put on for them. At these times, I find it's best to let the class evolve organically rather than attempt to shoehorn fifty minutes of material into thirty minutes of class time. In other words, ladies and gentlemen, welcome to the Improv! Time to go with the flow. That's right. I went all Mihaly Csikszentmihalyi on their asses. I quickly gave the weekly spelling quiz of ten commonly misspelled words (the word "misspelled" happens to be one of them), and launched in to the final cultural literacy tidbit of the week, the poem "Ozymandias." I mentioned last week in "Things Fall Apart" that I had decided to scrap the whole Victorian novel theme and go with Yeats, "Second Coming," Things Fall Apart, and "Ozymandias" in order to soothe my own soul on the heels of a crappy week. I have to admit, I was also curious about whether or not my students could synthesize these topics into a coherent thematic journey come Friday. Before reading "Ozymandias," I asked them to re-cap the week's cultural literacy for me. They had to explain each tidbit, then figure out how to move from one item to the next in a way that made sense. Why might Chinua Achebe choose a quote from Yeats' "Second Coming" as a title for a novel set in Nigeria?They had decided to define the "center" that cannot hold in "Second Coming" as "humanity" as it relates to the ethical standards of a society, they did a great job of tying that loss of humanity to what happened to the Igbo people as a result of the intrusion of Christian missionaries - or any European colonialists, for that matter. They had not read Achebe's book, I simply gave them a brief synopsis and let their brains run amok. Once they figured out why I had presented those four items together in one week, I moved on and pointed out that Shelley also wrote a little poem called "Prometheus Unbound." My students really know their mythology, so we talked about why he would be bound in the first place and what it might mean to unbind him. Then, I mentioned that Shelley was married to another Shelley - Ms. Mary - and that she was inspired to write Frankenstein at the same time her husband was writing "Prometheus Unbound." And that Dickens took inspiration from Frankenstein when he wrote Great Expectations. Talk amongst yourselves. I'll give you a topic: These works are thematically related. Discuss. I look at them and they look at me. For what seems like a wee bit too long. Suddenly a gasp, and an arm flies up. Arnold Horseshack is in the house. "Oh! Oh! I know! Prometheus made people, Dr. Frankenstein made the monster, and Miss Havisham made Estella!" This all tumbles out in one breath, so fast that some students have to ask their neighbors what the heck he said. "Nice. Great first step. And what are people trying to be when they go about creating?" Hands shoot up all over the place and one kid can't help but blurt out, "Gods!" We finally get around to the other creator - Magwich - and his creation, Pip the gentleman. A couple of weeks ago, I'd asked them why they thought Magwich went to all that trouble to make Pip a gentleman. They mentioned gratitude, that he saw Pip as a son, that he wanted to show up all of those people who think badly of him because he's a criminal...but I had told them I thought there might be more and asked them to file the discussion away until later. Once we started pulling this this thread on creation and monsters, I felt they could bring the conversation home. And they did. They saw the full spectrum of Magwich's motivations, and we spent some time talking about all the people in literature, mythology, and folklore who come to bad ends when they try to usurp the power of the gods. The short answer? It never ends well. And the alternate title of Mary Shelley's Frankenstein? The Modern Prometheus. They loved that. "The imaginary student pursued by the misshapen creature he had impiously made, was not more wretched than I, pursued by the creature who had made me, and recoiling from him with a stronger repulsion, the more he admired me and the fonder he was of me." I look up at my students, raise my eyebrows, and close the book. "And that? What you guys just did there? 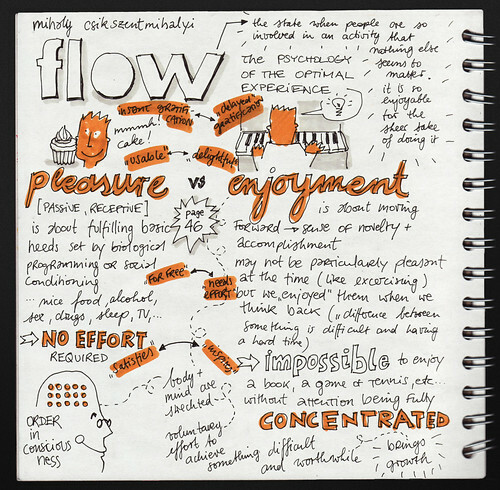 That's where we'll start on Monday, with Flow, Mihaly Csikszentmihalyi, Buddhism and Siddhartha."